It's no secret that I'm a HUGE fan of all things runDisney. I've run four consecutive Goofy Challenges during Walt Disney World's Marathon Weekend, I'm signed up for the 2014 Dopey Challenge, and just returned from a trip to Anaheim for my first West Coast runDisney race at the Disneyland Half Marathon. 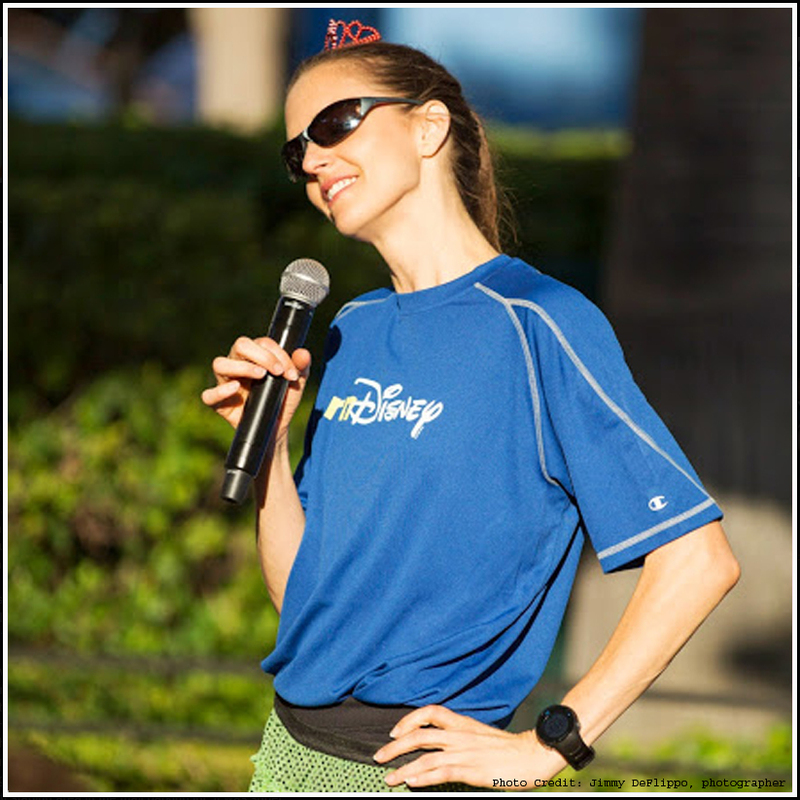 Being the fan that I am, I was beyond excited to be selected to be among the lucky few to participate in the Disneyland Half Marathon meetup on the Friday morning before racing began. 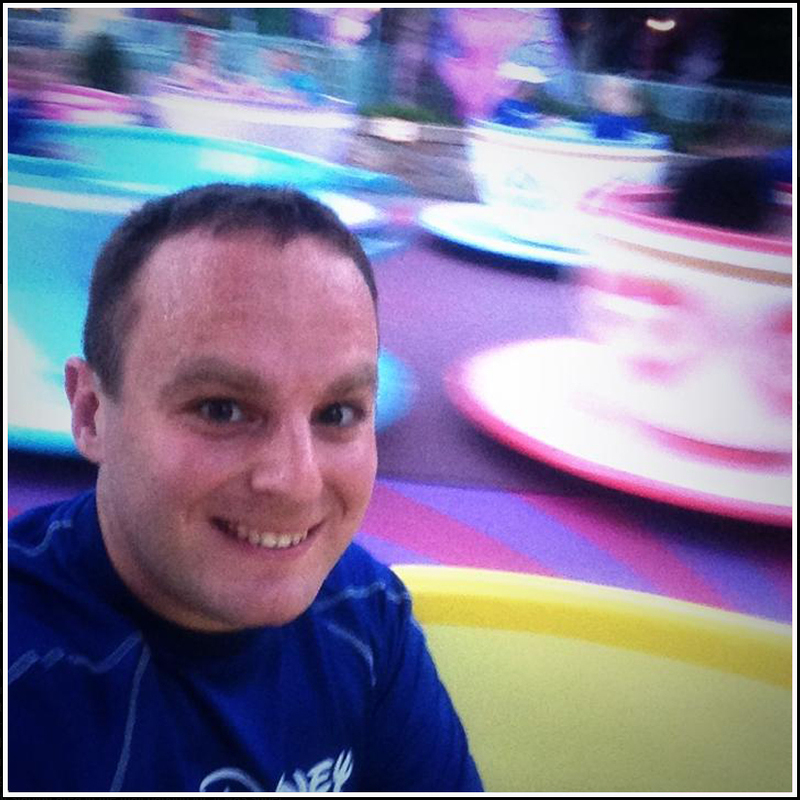 I'm going to need a chiropractic readjustment after finishing the 2014 Dopey Challenge in Walt Disney World. 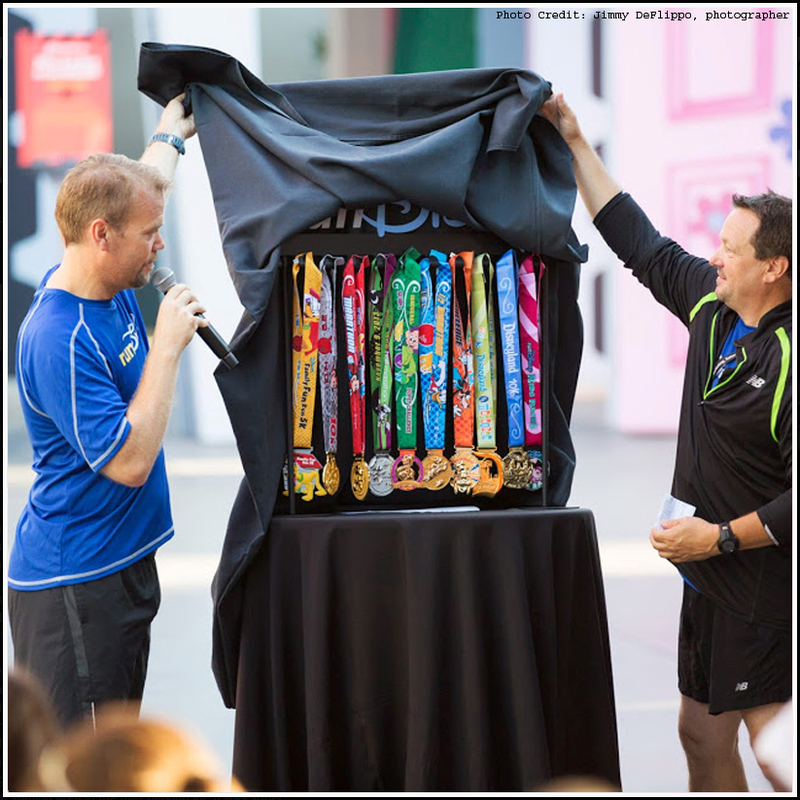 Faron Kelley, Director of Marketing for runDisney, was on hand for the meetup to unveil the medals that we'll be earning for completing the 5K, 10K, Half and Full Marathons. Plus, the redesigned Goofy Challenge Medal and inaugural Dopey Challenge Medal were on hand to make their grand debut. Each piece is stunning in its own right, but the collection is unbelievable. Which ones will you earn with me? After unveiling the marathon weekend medals, Faron took questions from participants. Obviously he was riddled with queries about what runDisney has on the horizon as they grow and offer more races and challenges. He teased that the runDisney team is working on 4 events currently. He wouldn't say if they were new events, revamped existing events, or overseas races. Specific questions about Star Wars themed or Disneyland Paris races were met with a smirk and "We have nothing new to announce at this time." Well played, Mr. Kelley. Well played. 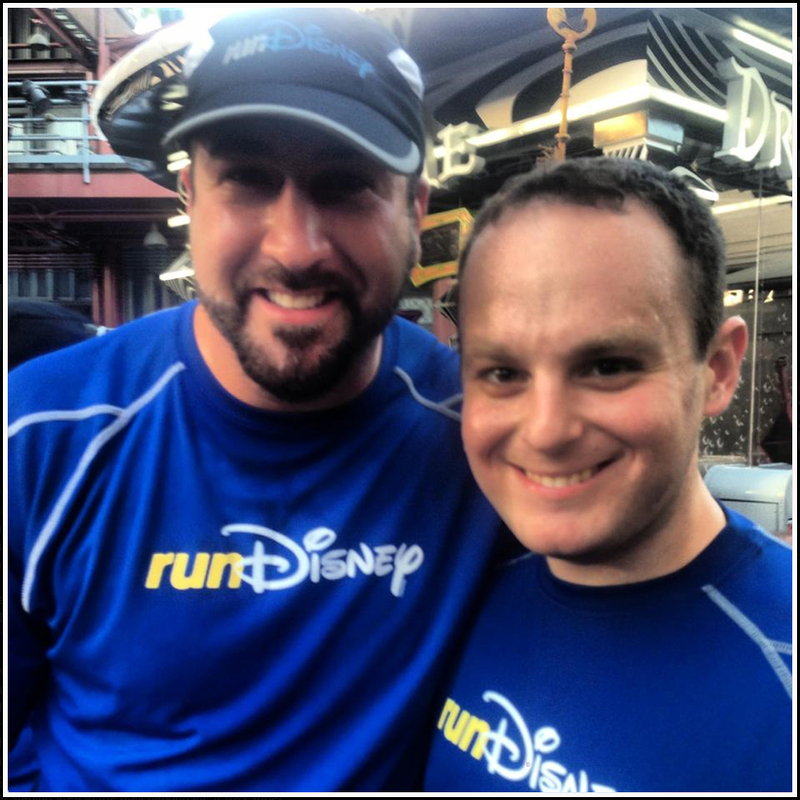 Coming right off his MTV VMAs N*SYNC reunion, Joey Fatone joined runners for the meetup and gave a brief glimpse in to why he runs Disney. 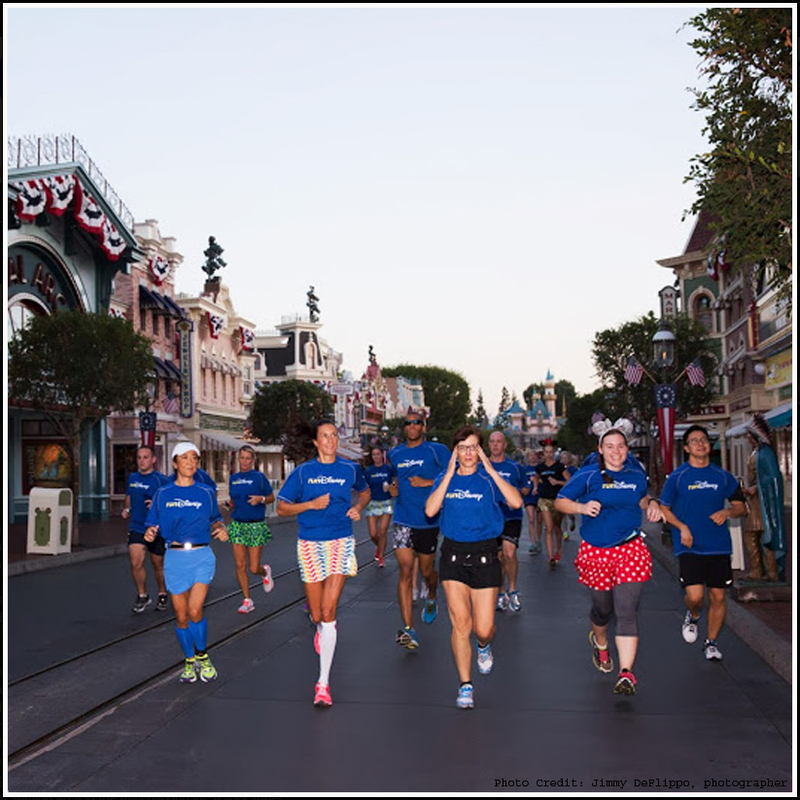 He signed up for his first half marathon and full marathon when he whimsically told his injured wife he'd run in her place for the 2013 Goofy Challenge. This time, he ran the Disneyland Half and 10K with his wife by his side. Employing the Galloway method, Joey finished the Dumbo Double Dare successfully. We even got a quick reenactment of some "Bye Bye Bye" choreography that he admits paid his kids' way through school. I asked Joey while standing in line for breakfast if he planned on going Dopey, and got a chuckle in response. We'll see if he changes his tune (pun intended) as January approaches. 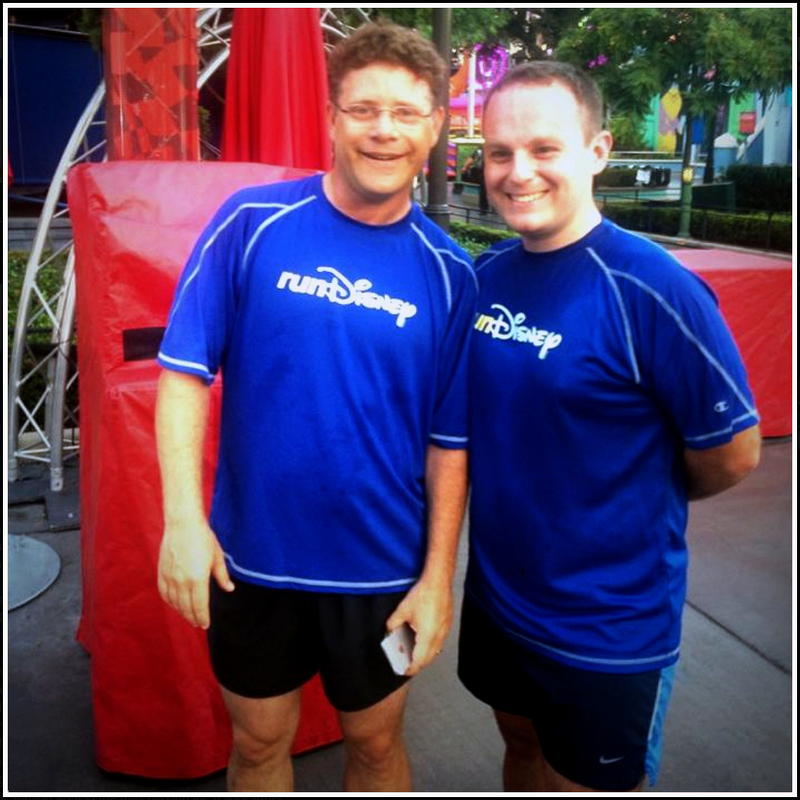 Another celebrity that joined us for the meetup was Sean Astin, star of "Rudy" and "Lord of the Rings." He's an avid runner and an inspiration with his #run3rd campaign. Upon introducing ourselves, he informed me that his childhood imaginary friend was named Fred. Just what I needed during my two mile run, imaginary expectations to live up to. But Sean was a super nice guy and a lot of fun to run with. As an east coaster who has visited Walt Disney World many times since childhood, adjusting to Disneyland takes some time. Once you get over the fact that its not as BIG as Walt Disney World, you realize that bigger isn't always better. We visited Disneyland first on the fun run that we took through the parks. Running up an empty Main Street USA toward the castle was surreal, and the intimate feeling that you get in that park is something that you can't get anywhere else. 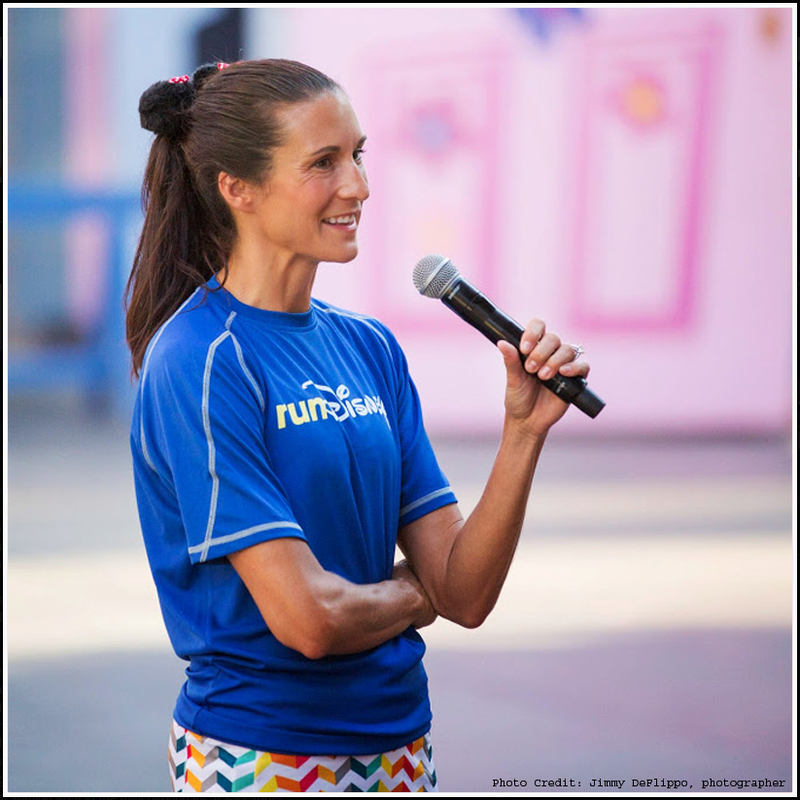 Tara Gidus, the official Dietitian & Nutritionist for runDisney, was on-hand to talk about how you can't just eat anything because you ran 13 miles (read her blog here). I know I'm not the ideal person to look to for guidance when talking about what I eat post-run (proof is on Instagram), but her tips about what to eat pre-run were helpful and consistent with what I practice. Coffee, peanut butter, bagels or wheat toast, and a banana are all great fuel for those long runs. They should be used during training and on race morning. Consistency is important. When the medals for Marathon Weekend were unveiled, the newly designed medal for the Wine & Dine Half Marathon in November was also released. I miss the presence of the Epcot centerpiece sphere, but do like the inclusion of the running Chef Mickey. This race is definitely on my runDisney bucket list. 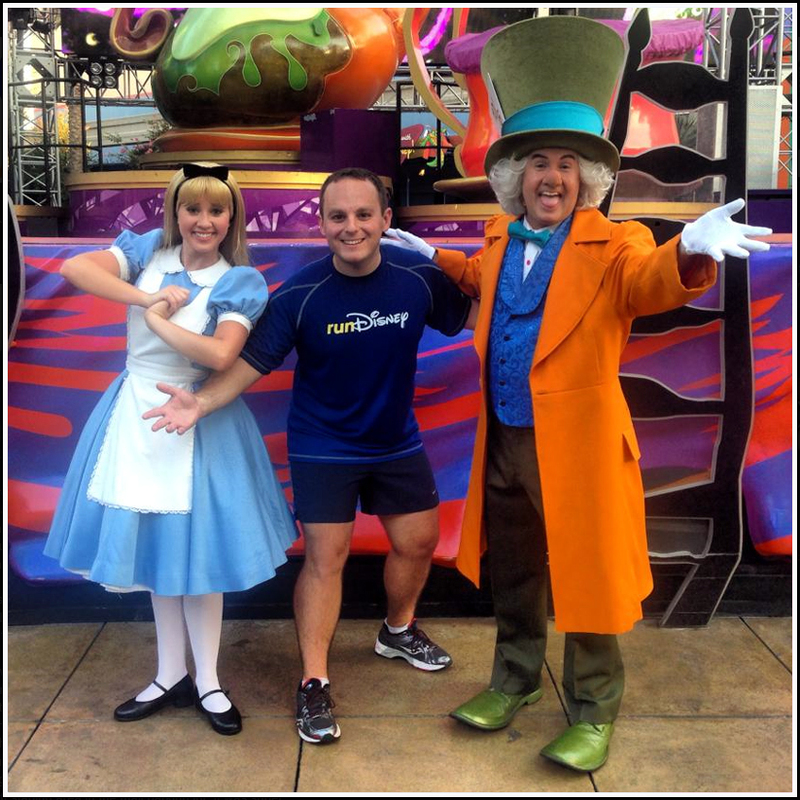 The theme of the newly introduced 10K during the Disneyland Half weekend was Alice in Wonderland. All tweets and messaging leading up to the meetup had an Alice twist, as did the surprises during the meetup. New Balance kicked off the meetup with a running clinic aimed at helping to improve posture, and it was interrupted by the White Rabbit who was late for an important date. The fun run included a brief stop for photos with Alice and a ride on the Tea Cups in fantasyland. The run concluded with the Mad Hatter hosting a Tea Party with refreshments. Getting some one-on-one time with Alice and her friends was a highlight of the morning. Also, ABC television was on hand to round out the Alice themed event with a glimpse in to their new show "Once Upon a Time in Wonderland," which premieres on Thursday, October 10th. The spinoff show features a darker story of Alice fighting to reunite with her love, who happens to be a genie. I've already set my DVR to check it out. The fun run concluded with a jaunt through Disney's California Adventure and the brand new Cars Land. Running down the main drag of Radiator Springs was incredible with all of the neon shining bright and lighting the way to the finish. This was the first time I had visited DCA since 2006 (the year that "Cars" premiered), so seeing the movie come to life was amazing. Any fan of the movie should make it a point to visit this park. After concluding the run through Cars Land, we were able to sit down in the Winner's Circle with the 2012 female champion of the Disneyland Half Marathon. 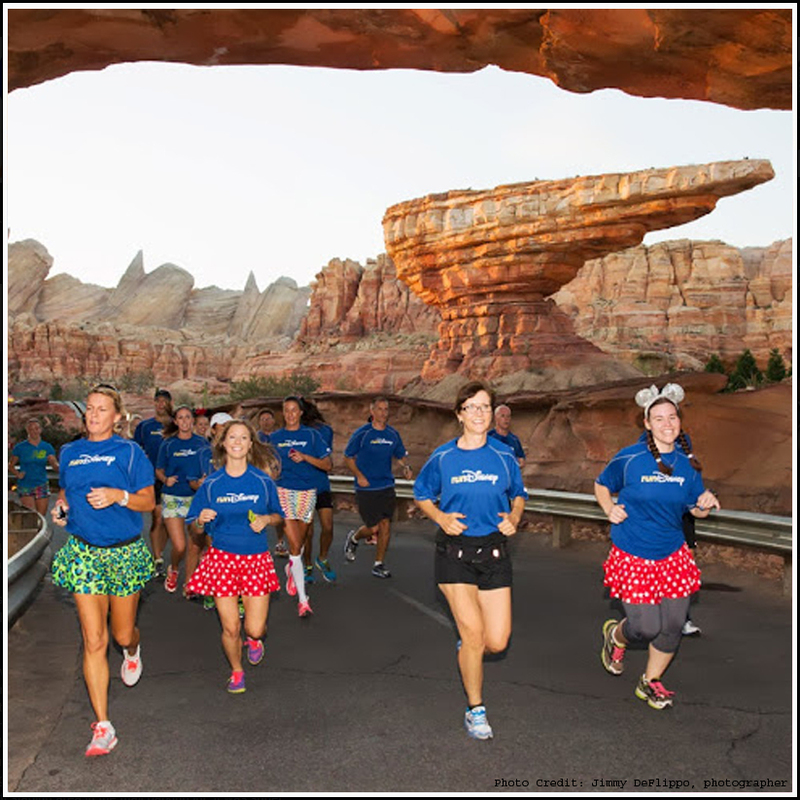 Cindy Lynch, co-owner of Running Skirts, debriefed us on what to expect during the race, highlights of the course, what her race routine is, and how it felt to win a runDisney event. Even though she is a champion of the race, she emphasized how important it is to enjoy the experience regardless of your time or how you place. It's a sentiment that I concur with wholeheartedly, especially when running through The Happiest Place on Earth. While I like to think I'm somewhat proficient at social media, I've never live tweeted an event before. I did a test run during the VMAs, adding commentary in 140 characters or less while watching the show. However, doing that from my couch is totally different than live tweeting while participating in a running event. I was able to get some translatable tweets and photos posted during the meetup, but a big lesson I learned was "Don't Text and Stride." A big THANK YOU to runDisney for putting on such a great event at the 2013 Disneyland Half Marathon Meetup. I can only hope to be a part of one of these events again in the future. 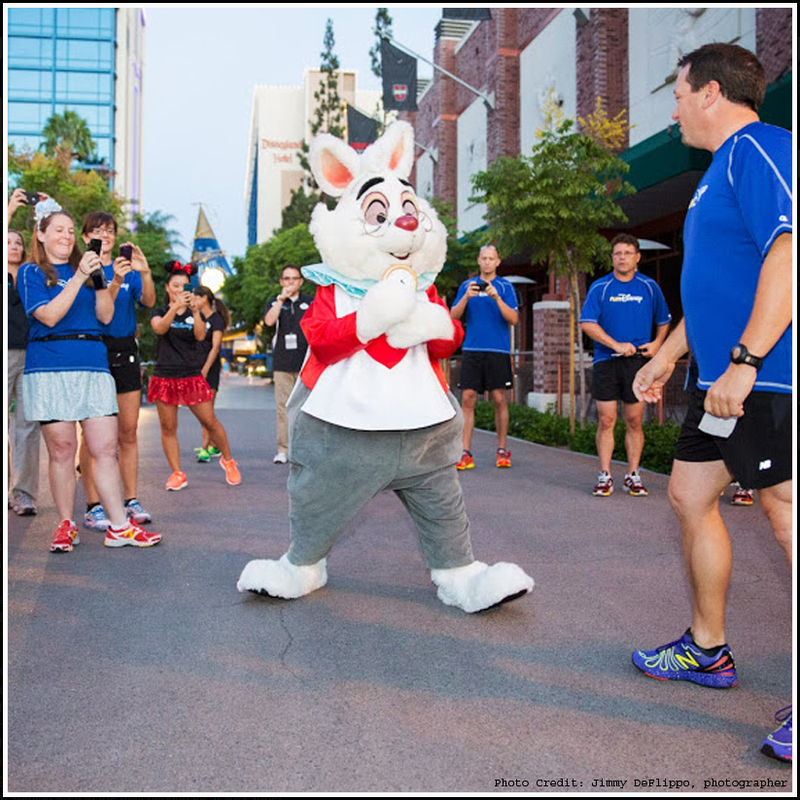 In the meantime, hop on over to the NOLArunner Facebook page and like it to see more photos from the 2013 Meetup and to get more recaps from runDisney events. Loved your top#10 recap from the Meetup! I think a pic with the White Rabbit and a ride in the TeaCups would have made it higher up in my book :) Way to go Fred!!!! oh and thanks for including :MYTHBUSTER: I CAN EAT WHATEVER I WANT! By: Tara Gidus Great article! Thanks Nicole! It really was a great event and awesome experience. I consider myself pretty lucky. The ranking of the Top 10 was hard, trust me. But when there's Disney bling involved, you know what's going to get top billing!